Hope you don’t mind our little light joke. We know you can handle it! 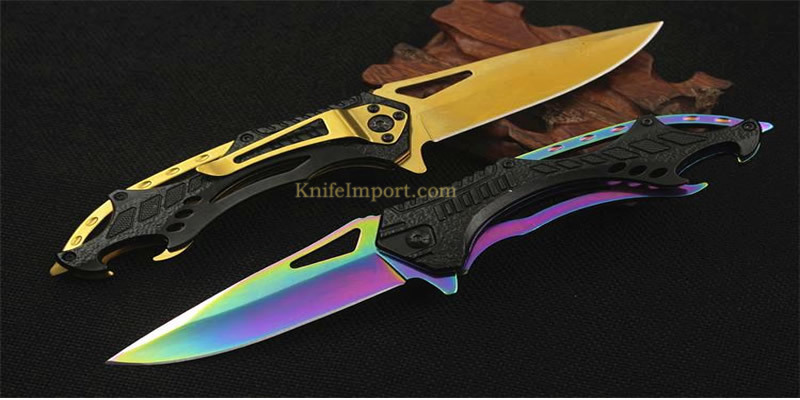 But before we start blowing your minds with the ten strange and yet cool pocket knives, you have ever seen, let’s tell you that you can find a huge amount of cheap spring assisted knives in varying quality, shapes and sizes on Knife Import at wholesale price. So, if you are in the market for buying pocket knives for sale, or just your personal use, then start browsing our cool pocket knife collection and purchase one or as many folding blades your pocket allows! One thing you may keep it in mind that the order in which these cool knives will appear have nothing to do with their level of ‘Coolness’. Okay! As the name clearly states this pocket knife completely resembles a shotgun cartridge however it’s not filled with gun powder but comes fitted with a 1.5-inch stainless steel blade, while its length measures about 2.5 inches when closed. Above shown cool folding knife makes a fine present for any outdoorsman that likes both guns and knives. A relic from the renaissance period, this blade is only shown for its badass outlook. For most people describe it as a rather impractical weapon. Anyone armed with this knife will be gunning for the absolute kill, don’t you think? However, you can get a cool folding pistol neck knife that only resembles a gun and nothing more or less than an awesome looking pocket blade. A type of folding blade that seems exactly like a key, in shape and size, however flicks open to reveal a tiny clip point pocket knife. Made by the Germans, this blade can be easily hidden in your pocket or slipped onto your keychain. Can serve as a good option among the list of self defense weapons, a suggestion just in case you were hoping to get a good pocket knife for your personal safety. Popular among the ladies, as it is targeted towards them, the Lipstick knife is a cool hidden blade. It can be carried in a purse, or your pocket, and can easily fool anyone to believe it be a regular lipstick—when clearly, it’s not! A strange looking but totally unique and cool pocket folding knife that has a beautiful Rados Ladder pattern blade, with an impala head supporting actual gold horns at the end of the handle, making it one of the coolest pocket knives in our list. A version of the pocket blade, revered for its various uses, a Swiss Army pocket knife is nothing but cool, still the manufacturers went too far with this. The Giant Swiss Army knife contains 85 different tools, weighing around 2lbs and wide as much as solid 9 inches. Totally impractical pocket knife yet cool enough to have 85 fully functioning implements in a compact casing. It looks very strange at first, but when you take a closer look you will find that it is a ladies’ leg pocket knife with a bottle opener, where the heel of the handle (and the shoe) can help open any crown cap bottle. All in all, if you are a collector of antique blade then this cool folding blade will be perfect for your collection. Once every sailor’s dream, a mermaid on her own is a cool fantasy creature but when you take a look at this cool mermaid pocket knife, you end up losing your cool over its awesomeness. We recommend that this one should definitely be kept away from the children at all cost. So, shown above were some really cool pocket knives that we searched for all over the vast reaches of the internet and included them in our strangely cool pocket blade collection. We think if we keep on looking around the web we might be able to find more strange and cool blade, but the above mentioned blades are more than enough for the time being. Just make sure that you keep frequenting our website, and reading our blogs, to know all sorts of interesting things about knives and swords. We hope to—see you again!